One fine sunny Southern California day, my editor and I traveled to the Orange County Museum of Art to see an exhibit of the works of Alexander Calder, whose light, delicate, elegant mobiles and stabiles are well known. Also featured in the exhibit were seven contemporary artists whose displayed works were inspired by Calder and whose inclusion reveals the enduring appeal of Calder’s work. The exhibit, which was rather extensive and took several rooms and hallways, was wonderfully designed. The walls were pure white, which accented the art perfectly; the décor did not distract or detract from the pieces on display and created a hushed, still, peaceful space. According to the exhibit, the term “mobile” was coined to describe Calder’s work, derived from a French pun meaning both “motion” and “motive”. My editor and I particularly enjoyed walking under and around the mobiles, watching the slightest air current cause the beautiful forms to shift ever so slightly. Calder’s mobiles are wonderful. His design and arranging of the various wires and colored pieces of sheet metal dangling from the central spine is truly masterful and harmonious, delicate yet strong, balanced yet unbalanced, intricate yet seemingly simple. The pure visual impact of the larger mobiles, particularly “Snow Flurries” is quite arresting, with the tiny white metal circles suggesting snow. “Big Red”, an enormous mobile, was also a highlight, with its dangling angular shapes resembling bird feathers. The mobiles, some of which were quite large, seemed as if they were fragile birds ready for the skies. Also prominently on display on the exhibit were some of Calder’s stabiles, which resemble mobiles but are attached to a base on the ground. My personal favorite piece in the exhibit was the stabile titled “Snow Flakes and Red Stop”, which consisted of interconnected black wires along with small white circles and one large red circle which dangled from the wires. The elegance of the piece, with its simple colors and its use of the red as visually interesting punctuation, symbolizing the end of the snow, was stunning. In addition, the exhibit also featured Calder-inspired works by contemporary artists. Some works were more memorable than others. Highlights included Jason Middlebrooks’ mobile in the style of Calder, “Wood From All Over the World”, from which dangled pieces of driftwood collected by the artist in Hawaii; Kristi Lippire’s “Hanging Garden”, a mobile from which sprouted beautiful metal plants and leaves; and Nathan Carter’s eclectic piece “Radar Reflector Origin Petit Calivigny Grenada”, which consisted of a huge wire circle divided into sections with wire and from which dangled small brightly colored pieces of metal. This exhibit has many wonderful Calder pieces and some interesting contemporary works. 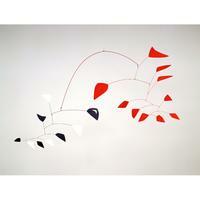 This exhibit closes September 4, so for all Calder fans, hurry to see it! Great review! You have done an excellent job of describing the works for those not fortunate enough to have caught this exhibit. Well written and a wonderful job of looking into Calder's world and the influence he has had on others. Welcome back to the blog! Very thoughtful review. Any ideas about his inspirations?